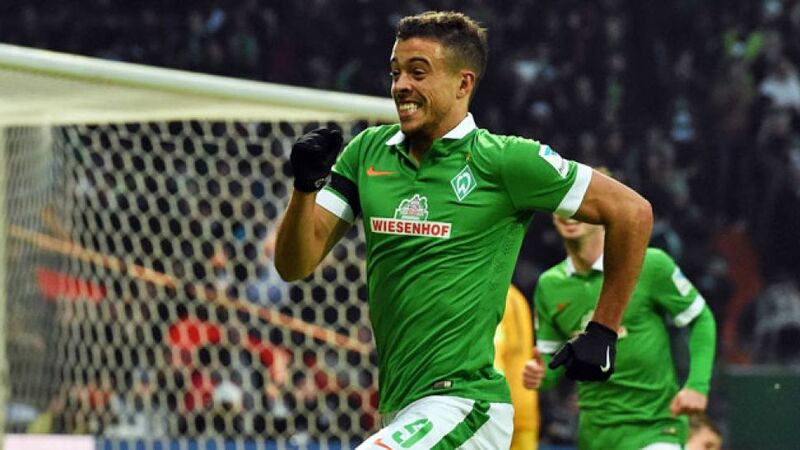 Cologne - After his acrobatic volley secured SV Werder Bremen a 2-0 win against Hertha Berlin, Franco Di Santo has been chosen by bundesliga.com users as winner of the Matchday 18 Goal of the Week award. The 25-year-old, who had already opened the scoring at the Weser Stadion on his return from injury, garnered 45 per cent of users' votes for his stunning volley in the 69th minute. A lovely through-ball from Davie Selke had found the overlapping Clemens Fritz, whose inch-perfect cross was met by an airborne Di Santo placing his effort beyond the despairing dive of Hertha keeper Thomas Kraft. Following the Argentine in second place with 41 per cent of the vote was VfL Wolfsburg's Bas Dost, whose half-volley from the edge of the area on the stroke of half-time made it 2-0 against FC Bayern München in the Wolves' eventual 4-1 victory. The fourth goal in the Volkswagen Arena was scored by Kevin De Bruyne, whose thumping finish won him 11 per cent of the vote. The opening goal of Nils Petersen's debut hat-trick, which inspired SC Freiburg to a 4-1 home win over Eintracht Frankfurt, brought the 26-year-old two per cent of the vote, while Pablo de Blasis' curling finish in 1. FSV Mainz 05's 5-0 rout of SC Paderborn 07 picked up one per cent of the poll.